You can use feng shui for creating truly welcoming guest bedrooms. It all begins with the feng shui basics and layering from there. The feng shui basics dictate the best bed placement along with proper arrangement of other furniture pieces. You should follow these important rules as well as selecting the appropriate bed style. You want to ensure your guests get a good restive night's sleep. Feng shui rules dictate that is achieved when the bed is diagonally across from the door leading into the bedroom. If this bed placement isn't possible and you must place the bed in front of a window, there are a few feng shui solutions for this. If your guest bedroom doesn't have a solid wall for the bed placement or if the solid wall is directly across from the bedroom door, then you may end up placing the bed in front of a window. You can still ensure your guests' comfort. Choose a tall and solid headboard either wood or upholstered that can serve as a wall. Place heavy draperies over the window and close them at night. Set the bed six inches away from the window to allow chi energy to flow between bed and window. You want your guests to be comfortable so don't scrimp on the furniture for this room. Many people put their old bedroom furniture in the guest room. While this is economical, it might not be inviting. If the bedroom suite is simply tired looking, but still good quality, you can refinish it with a coat of paint or stain. If it's beyond refurbishing, you may need to replace it. You might be able to sell old bedroom furniture on consignment and put the money down on a moderately priced guest bed or bedroom suite. Nightstands or tables should match for auspicious chi. Round tables or rounded nightstand corners prevent creating poison arrows and encourage the chi energy to move about the bed. You can add a comfortable loveseat, chair or a bench at the foot of the bed. Avoid placing a desk, TV and other electronic equipment in the guest bedroom. In addition to a nice bed, dresser and nightstands, you want to provide a comfortable sleep for your guests. This means you need to provide a good mattress and bed linens. Invest in a good quality mattress so your guests don't feel like their comfort is unimportant to you by having to sleep on your sagging castoff mattress. Buy luxury bed linens that match to be used only in your guest bedroom for a genuine special touch. Add nice throw pillows for comfort and style. When you design a guest bedroom using feng shui principles, you want to create a balanced chi energy. The bed should be made and ready for guests. Provide guests plenty of storage options from a dresser to a closet. These should be empty if possible. Never store anything underneath the bed. Leave this area open for chi to move about. Make guests feel pampered with a hospitality basket filled with your choice of comfort items. You want to create a respite for your guests. The color(s) you select can convey the right calming effect for a yin bedroom. The most commonly used guest bedroom color is green followed by blue then yellow. A combination of these colors ensure a cheerful and welcoming bedroom. All imbue a peaceful energy conducive to sleep. Some people overuse feng shui symbols, so don't place a lot of feng shui charms in the guest bedroom. This will create clutter. There is no need to include every feng shui symbol you can to attract good chi energy. While symbols are fun, the true art of feng shui is placement. 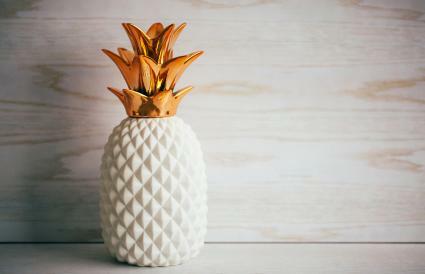 You aren't limited to only using feng shui good luck charms that might not go with your décor style. Select feng shui generic symbols that are styled to reflect your guest bedroom décor yet still represents the feng shui symbol. A turtle brings the luck of a long life and happiness. You can place a ceramic turtle on a nightstand beside a vase of peonies. A deer symbolizes a long life and can be used as a ceramic figurine on a dresser or scenic painting. A conch shell has multiple meanings depending where it is placed, such as the southwest corner for a happy marriage or love relationship. Welcome your guests with a true feng shui symbol of hospitality. These include a pineapple, magnolia blossoms or peony blooms. Any of these can be added as a subtle picture, painting, or a small figurine on a bedside table. Avoid live flowers in the bedroom. The yang energy can be too much for yin décor. Don't use dried flowers since they were once alive, and the chi energy of dead flowers is inauspicious. You can use silk flowers without any feng shui concerns. It's easy to create a welcoming guest bedroom when you stick with feng shui principles. Your guests will greatly appreciate the thought and care you take to give them a truly comfortable respite during their visit.